Francis J. Crosson, MD, is a senior fellow at the Kaiser Permanente Institute for Health Policy and the chair of the Council of Accountable Physician Practices (CAPP), a policy development organization of 34 of the nation's largest medical groups. Laura A. Tollen, MPH, is a senior health policy leader at the Kaiser Permanente Institute for Health Policy. 1 Introduction and Vision (Francis J. Crosson and Laura A. Tollen). 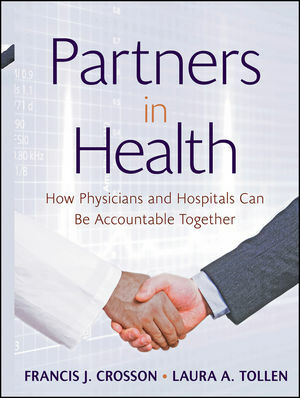 2 History of Physician-Hospital Collaboration: Obstacles and Opportunities (Lawton R. Burns, Jeff C. Goldsmith and Ralph W. Muller). 3 Achieving the Vision: Structural Change (Stephen M. Shortell, Lawrence P. Casalino and Elliott S. Fisher). 4 Achieving the Vision: Payment Reform (Stuart Guterman and Anthony Shih). 5 Achieving the Vision: Operational Challenges and Improvement (Bruce Genovese). 6 Overcoming Barriers to Improved Collaboration and Alignment: Legal and Regulatory Issues (Robert F. Leibenluft and William M. Sage). 7 Overcoming Barriers to Improved Collaboration and Alignment: Governance Issues (Jeffrey Alexander, Gary Young and Commentary by James DeNuccio). 8 Overcoming Barriers to Improved Collaboration and Alignment: Cultural Issues (Katherine A. Schneider). 9 Special Issues for Net Hospitals and Clinics (Benjamin K. Chu). 11 What Needs to Happen Next? (Francis J. Crosson).